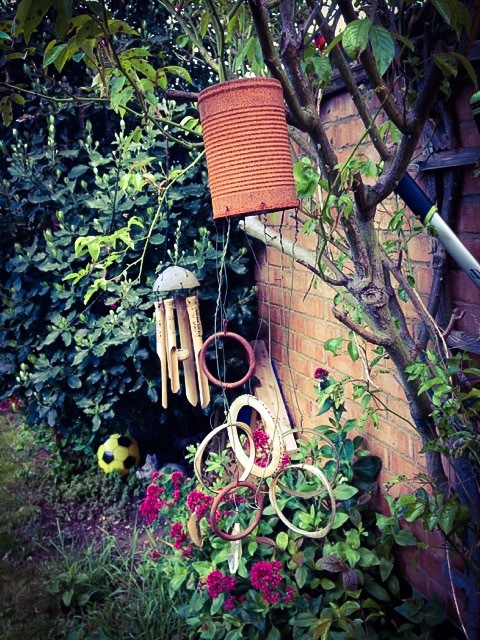 Our secret garden – Hidden gems in a kids play area. On first glance, our garden appears very ordinary. 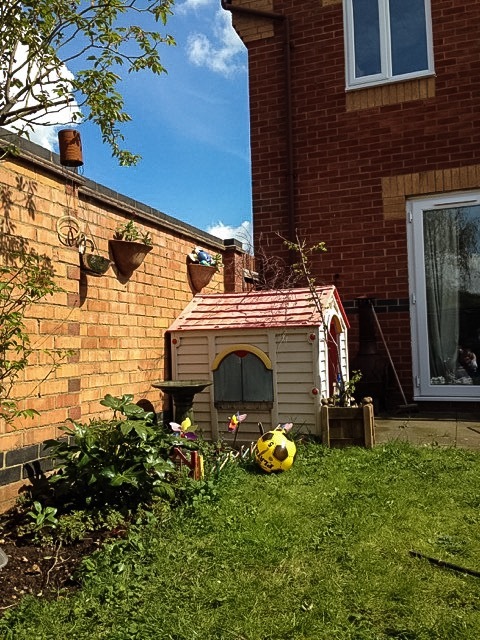 It’s plain, it’s small and it’s mostly just grass with a border and small bit of patio – all littered with very clear signs of being well used by a child. However, on closer inspection, our garden has some hidden gems I’d like to share with you. 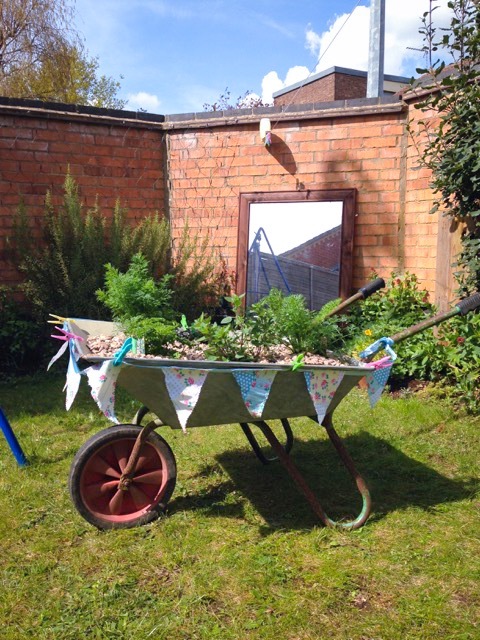 With inspiration taken from last years visit to Dawn Isaacs garden, we have planted a herb wheelbarrow. Herbs are great to have in the garden if you have children. They offer sensory experience with the different smells they produce and you can get your children involved with cooking by letting them cut what you need for your meals. They are very easily put together and maintained and you can even brighten them up a bit with a bit of bunting. Mirrors are often used in decorating to bounce light around and make rooms appear larger so why not use them in your garden too. When we moved into this house last year, we found we had no wall space to hang our big mirror so it ended up going in the garden. It sits against the back wall reflecting most of the garden back but they can be used to hide unsightly bins, sheds or even your kids’ outdoor toys. A tall wooden box is hidden behind the bush towards the back of the garden. We use this for veg scraps and peelings, egg shells, grass cuttings and paper etc. Dexter enjoys putting things in the heap and has taken an interest in the bugs that live in and around it. We have a few sets of lights dotted around so far but we are planning to add to them. We have a string of warm white twinkly fairy lights along the fence, a net of bright white lights along the back wall and some colour changing daisy lights going up a trellis. I’d like to add some more lights along the border at some point too. We started building this in autumn last year but with me being pregnant and quite exhausted, the project got a bit neglected so we aim to finish it this year and make it a bit better than it currently is. Dexter really enjoys looking at bugs, especially ladybirds with his magnifying glass, so once the hotel has some residents, this will be fantastic for learning and exploring. Another thing to thank Dawn Isaac for. This strawberry is still going strong from last year although it could probably do with a bit of fresh soil. I found we got a lot more fruit from strawberries last year as being higher up meant they weren’t being eaten by various creatures. Plus, they look lovely when they sort of cascade over the side. Next year I plan on hanging our tomatoes too. As I said, at first glance, our garden does look like it’s just for kids with the swing, slide and trampoline all being the first things you see but it doesn’t take much before you start to notice its little quirks. We still have room for patio furniture and a chiminea without cutting down on play space and when you consider the mess of a garden we had last year, I’d say this is a huge improvement. 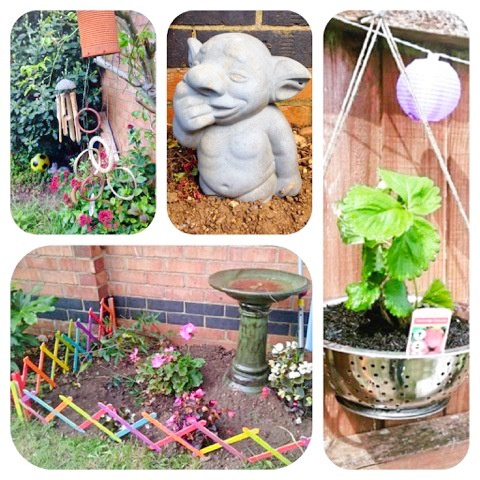 Your garden looks fab, I especially love the wheelbarrow herb garden!